If you live in the U.S. and made a purchase with a debit card or credit card in any other country between February 1, 1996 and November 8, 2006, there’s a good possibility that you qualify for some kind of reimbursement for some amount of reimbursement for a portion of the foreign currency conversion fees charged by your card’s issuing bank. 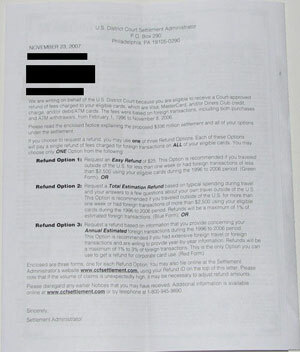 Plaintiffs challenge how the prices of credit and debit/ATM card foreign transactions were set and disclosed, including claims that Visa, MasterCard, their member banks, and Diners Club conspired to set and conceal fees, typically of 1-3% of foreign transactions, and that Visa and MasterCard inflated their base exchange rates before applying these fees. The Defendants include Visa, MasterCard, Diners Club, Bank of America, Bank One/First USA, Chase, Citibank, MBNA, HSBC/Household, and Washington Mutual/Providian. They deny the Plaintiffs’ claims and say they have done nothing wrong, improper, or unlawful. I know I’ve been to Mexico and China once each during that time frame, along with making several trips to Canada. What I don’t know is if it’s worth digging through old statements and receipts to try and get reimbursed for what likely amounts to only a few dollars. The FAQ says that the issuing bank for each card has to provide me with any statements I don’t currently have in my possession in order to make a claim, but I’m still unclear about whether this is actually “worth” doing. Can I submit estimated yearly foreign transactions for years where my records are either incomplete or I no longer have statements to support my transactions? First a reminder: Pursuant to the Revised Plan of Administration and Distribution, paragraph 5(f), Exhibit H, to the Stipulation and Agreement of Settlement, the Bank Defendants shall provide, free of charge, your monthly billing statements, if retrievable electronically, to any Settlement Damages Class Member who request these statements to substantiate his or her claim form. If you are a customer of Household/HSBC or Providian/Washington Mutual, you should contact the Settlement Administrator for your electronically retrievable transaction records. If you decide to file for Refund Option 3 you need to list the amount of foreign transactions by year. If your records remain incomplete and you are unable to obtain them from your bank, you may calculate yearly foreign transactions using estimates. You should calculate these estimates based on reasonable daily or monthly spending, documented, where possible, by a travel journal or some other proof of your travel or your living arrangements outside of the United States. Although you do not need to submit any documentation with your claim form, you should retain the supporting materials, along with a written explanation of the methodology used to determine the estimates listed on your claim form, in case your claim is designated for audit by the Settlement Administrator. It’s my money and I’m entitled to it, but I have a feeling that the opportunity cost of tracking down my foreign purchases will be greater than the subsequent checks I might get back from various banks. Maybe if I were making weekly trips out of the country. Anybody else seen a reason to chase down this reimbursement? I got this information in the mail yesterday. Option one is clearly the easiest and gives you $25 immediately. But I can’t help thinking that if I chose this the litigation lawyers would make a killing. From a quick scan of the details, it’s not clear how much extra I’d get for digging out those old credit card statements. I’ve got them going back for years. So I might just grab some from 2 years ago (last trip to Ireland) and see what the benefits would be from collecting and giving them all the extra details. I travel to Mexico often, and use my debit card for hotel and food, plus other purchases. I am sure that I have been overcharged. I’ve never traveled outside the US so I have no idea why they sent me the packet or letter. Scam? Option 1 says you’ll get $25 back, option 2 says you’ll get 1% of what they (some computer program) estimate you spent based on the number of days you were overseas. They do not tell you that number, but you are guaranteed $25 minimum, so it doesn’t hurt. Under their FAQ’s it says the lawyers get almost 30% of the settlement. The extra digging says you could get 3% back of what they charged you, but who knows. Seems like a lot of work. As for never traveling overseas, Canada and Mexico count, as does purchasing from a non-US country (ie. web site, phone). I just got the info yesterday and after researching, I’m content that Option 2 can’t hurt since I estimate I spent at over 50 days out of the US in the time span. I know I will have charges on cards that they could verify if I give them the approximate dates. It helps I have had a max of 3 cards in ten years. Yes, I may get nothing, but it took less than 5 minutes for me to estimate the number of days I was out of the US and fill out the online form with my claim number they mailed me. I was overseas in England from Aug. 1996 to Dec 17, 2005. I was working for a contractor and lived there for that period. We, my wife and I, took several trips back to the states for approximately one week at a time so if I fill out form #2 I should put down 29,608 days spent overseas the form only has space for four digits for time spent overseas. Should I fill it out or how would I do it? I was puzzled by this letter as well. With the option of including a credit card number, I also wondered if it was a scam. I’ve never used a credit card outside of the US. The I remembered. with usage of PayPal and eBay, who knows where your money is going. I’m going for the “Easy” twenty five dollars. Yes, the lawyers will retain more, but in a class action they get all of the money anyway. Free $25 bucks in my book. I don’t see how you came up with 29,608 days. Ten years = 3650 days. Four digits will be enough. Does anyone know what factor they are using for option 2? Factor times the number of days spent outside the US? It appears that the purpose of travel may also be included in the equation. I was trying to guess if more time spent traveling on business or more time spent on vacation and lesisure had the higher factor. Whats your guess? Why is it so hard to get to the e-forms. I’m looking for a refund undet option 2 but all iIsee is companies who do it for me, for a fee of course.How can I just fill out the form as it says in my correspondence and submitt it? I attended the Fairness Hearing for this case (Currency Conversion Fee) today and objected to the settlement as unduly favoring the class lawyers’ interests over the class members’ interests. One thing that many people do not know is that Option 2 actually has a $25 minimum recovery (subject to pro-rating), just like Option 1 does. So there is no reason really for anyone to choose Option 1. Option 2 guarantees a return of at least as much as Option 1, and maybe more. Here it is late Oct. 2008 – nothing has been heard from this action as to the $25.00 much less big money – this could go on forever so don’t get excited about it. Some of us may not live long enough to get anything ever. I think the mail out was a ‘have to’ thing and they think it will be forgotten or disregarded. I just happend to run across my letter today and decided to check out the website.